Motorcycles should be simple. They should be exposed and unobstructed, much like the experience of riding them. I believe that good design appears in the lines, stripping away all the unnecessary gimmicks to present the machine in its purest form. But great design … Great design appears in all the things you don’t notice. It’s not in the things you can see or touch; the magic of a great motorcycle should be something you can feel. In the fall of 2015, Swedish motorcycle manufacturer Husqvarna invited us to the annual EICMA Show in Milan, Italy, to witness the unveiling of their new Vitpilen 701 concept bike. Swedish design has always been synonymous with quality and minimalism, and true to its DNA, the Vitpilen revealed absolute excellence in its simplicity. I could feel that magic “something” immediately as I gazed upon the masterful work in design. With today’s popular trend of retro-inspired motorcycles and motorcycle culture, the Vitpilen 701 is a breath of fresh air. The progressive and forward-thinking design breaks boundaries with a nice reminder to stop looking to the past and start dreaming about the future. I’m a sucker for nostalgia just like the next guy, but from a design standpoint, the seamless aesthetic and unique lines of the Vitpilen stand alone and offer a new perspective on motorcycle design. Reduced down to the bare essentials of what a bike should be, the Vitpilen is a jaw-dropping statement for Husqvarna’s bold return to street. Two and a half years have passed since I first laid eyes on the Vitpilen 701 concept, and the anticipation to ride it was finally coming to an end. The first production models recently landed in the States, and I would be lucky enough to journey out to beautiful Palm Springs, California, to be one of the first to swing a leg over it on American soil. Palm Springs is a cultural desert oasis, hosting the world’s largest concentration of mid-century modern architecture. Since the 1920s, visionary modernist architects have designed sleek homes to embrace the desert environment. The dramatic geographic surroundings of the Coachella Valley inspired a design aesthetic that became known as Desert Modernism, where the simplicity of the desert landscape is reflected in the minimal design of the architecture. Notable for its use of glass, clean lines and sophisticated design, Desert Modernism evoked a lifestyle of simplicity and elegance. Palm Springs became the place – as journalist Joan Didion once wrote – for dreaming the golden dream. Influenced by the intensities of living in a desert climate, this style of architecture aimed to be the perfect combination between form and function that challenged the current idea of what a home should look like. Thoughtful design became part of daily life, with ideals to not only look stunning, but also improve the experience. These principles very much remind me of the design philosophy behind Husqvarna’s Vitpilen 701, and the more thought I put into this connection, the more I realized that there could not be a more appropriate location to ride this motorcycle. The Vitpilen 701 and Palm Springs’ Desert Modernist architecture have a lot in common. Both dance between the balance of form and function and the relationships of materials in an effort to create a seamless transition through space. They both feature a minimal design aesthetic that has been purposefully built to complement the experience. 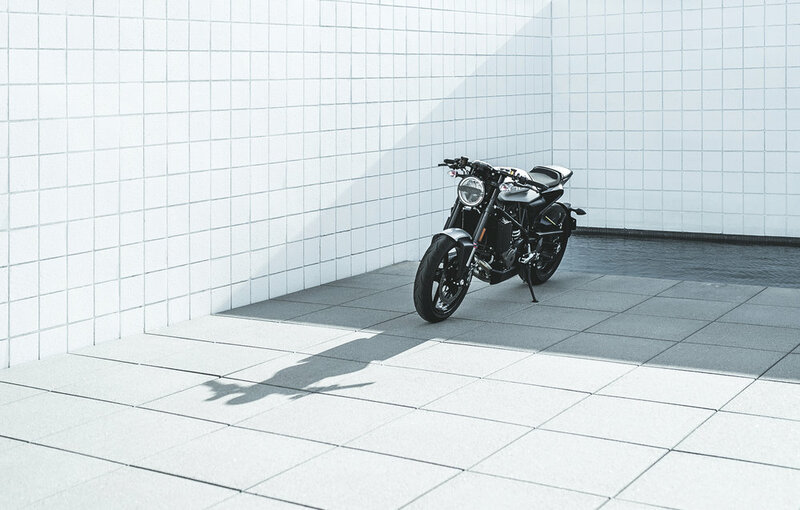 And when combining the elements of this modernist architecture, the minimal desert landscape and the progressive design of this motorcycle, it begs the question: Does innovation really need to be complex? Husqvarna has answered this question clearly with a motorcycle culminating in 115 years of progression, innovation and a never-ending quest to pioneer new territory. I found that magic “something” in the honest and thrilling riding experience enabled by its simple and progressive design. As the sun sets over Palm Springs and I reflect on the day’s ride, this motorcycle has made an obvious statement: Perfection is not about more or less, but the balance of precisely enough. It’s about finding equilibrium. There is a fine line between too much and too little, and with the new Vitpilen 701, you can finally ride that line.